When it rains, it pours, and the good news is really pouring in for the world’s leading online casino software development firm, Microgaming. 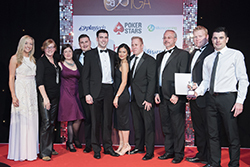 The company is putting on a fantastic show at ICE Totally Gaming, just after accepting new industry awards for its mobile casino product and partnering with the biggest name in interactive gambling. Twelve years ago, Microgaming made history by launching the world’s very first mobile casino. Let’s not forget that smartphones didn’t even arrive on the scene until 2007, two years after Microgaming (again) pioneered what would become a global multi-billion dollar industry. On Monday, February 6, the company scooped yet another award for its ever-evolving mobile casino platform. Microgaming accepted the Best Mobile Product 2017 award at the 10th annual International Gaming Awards (IGA). For the last 10 years, Microgaming has hosted a bar at the annual ICE Totally Gaming Expo. This year is no different, but the theme is as variable as its ever been. From February 7-9, the Microgaming Bar will display a different experience for visitors with each new day. 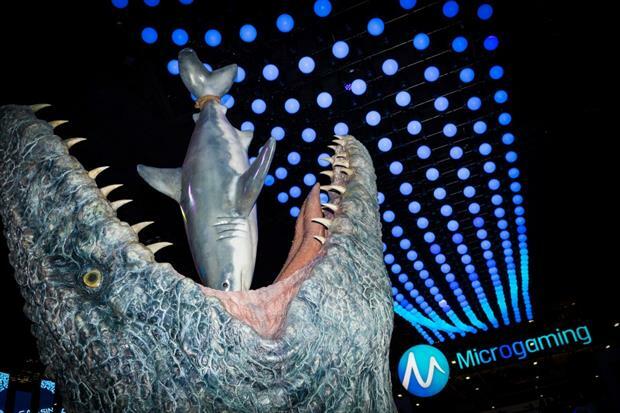 To kick things off, the online casino software giant set up a massive 5m x 5m sculpted display of a shark-eating Mosasauru – the enormous, genetically enhanced marine reptile from the 2015 film, Jurassic World. The exhibit is an experience in and of itself, complete with a guide to teach visitors about the fictitious beast, and help them find the best vantage point for a photo op. The impressive exhibit was designed to celebrate the company’s new Jurassic World Online Slot. And that was just day one…..
How does the world’s largest and most respected online poker company gain more recognition for its online casino venue? By partner with the world’s most respected online casino content provider. That’s right, Microgaming and PokerStars have actually teamed up to deliver the software developer’s immense variety of casino slots, table games, video poker, specialties and more on the Amaya-owned PokerStars Casino. The agreement will see Microgaming supplying its award-winning desktop and mobile casino gaming platform, Quickfire, on PokerStars Casinos. The games are expected to be integrated into the PokerStars portfolio in the summer of 2017 across all non-US PokerStars sites. PokerStars COO, Guy Templer, indicated that – among other things – Microgaming’s extensive series of high-paying progressive jackpot slots (like the Mega Moolah) was a major selling point when the agreement was struck. It’s not certain whether Microgaming’s games will be employed at PokerStars New Jersey. That online casino is – for the time being – powered only by Swedish gaming software firm, NetEnt. Microgaming hasn’t licenced its games to any US-facing operator in the last decade, following passage of the UIGEA.